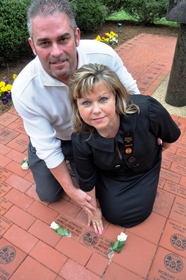 Among those who took part in this year’s Workers’ Memorial Day remembrance of IAM members killed on the job was Shawn and Deanna Woedl, whose brother, Local 447 member Carl “Rock” Root, 45, died on April 3, 2013 in a workplace accident. With the workplace tragedies of West, Texas and Bangladesh still fresh in the news, IAM members were reminded of losses closer to home during the annual Workers’ Memorial Day gathering at the William W. Winpisinger Center in Hollywood, MD. Among the fallen honored this year are Carl “Rock” Root, 54, of Local 447, a driver for New England Motor Freight who was killed in a workplace accident earlier this month; Larry Stevens, 56, of the National Federation of Federal Employees (NFFE) Local 1855, who collapsed and perished at his job at the Pine Knot Job Corps in Kentucky; and Edward Peters, 45, of Local 1886, 45, a United Airlines mechanic who died on the job in January 2005. Vance H. Grubbs, Sr., 47, of Local W401, who passed away on April 13, 2013. District 78 Directing Business Representative Paul Mitchell, 48, who died in March 2013 shortly after being diagnosed with cancer. Former Grand Lodge auditor Bill Dameron, 56, who died in June 2012 after an illness. Former Midwest Territory General Vice President Merle Pryor, 80, who passed away in June 2012. Chas Johnson, 55, of Local 839, a Boeing/Spirit AeroSystems employee and second-generation union member and shop steward who passed away in April 2012. John Givens, of Local 1932, who passed away from pancreatic cancer in June 2011. Timothy Louis Ray Godfrey, 29, of NFFE Local 1185, who died in an April 2011 boating accident. Carmen Patete, a Retirees Department employee who died in April 2011. Former William W. Winpisinger Center Education & Technology Center employee Margaret Jane Brawley, 83, who died in February 2011 after in illness. Click here to learn more about Workers’ Memorial Day.